More than one billion people around the world call themselves members of the Catholic Church, but as of December 8th, only 546,765 of them were following Pope Benedict XVI on Twitter (nom de tweet: @pontifex). Here's how Catholicism's truly faithful followers are spread out around the world. Map based on all followers of @pontifex on December 08 2012. Of the pope's 546,765 followers on that date, 283,796 could be geocoded based on their user-provided location information. 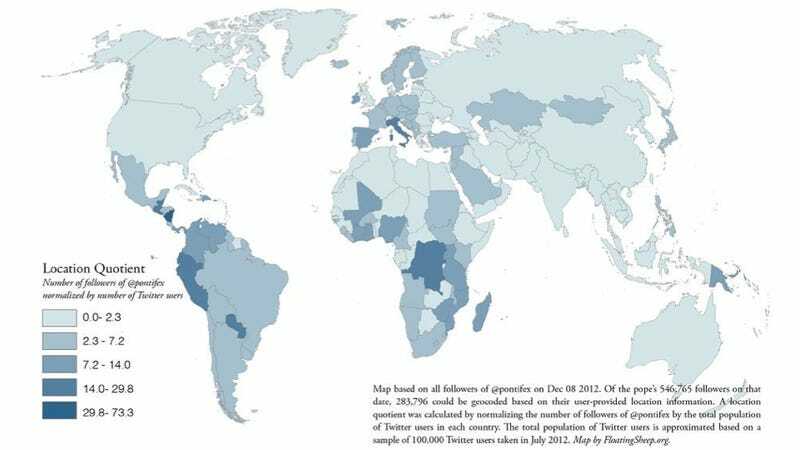 A location quotient was calculated by normalizing the number of followers of @pontifex by the total population of Twitter users in each country. The total population of Twitter users is approximated based on a sample of 100,000 Twitter users taken in July 2012. The location quotient referenced indicates the number of twitter users following His Holiness relative to the total number of Twitter users in each country. A pretty poor showing, overall, to be honest. More godly map-goodness from flying sheep: Tweets of the words "beer" and "church" by U.S. county.